Archives of Eaton Bray News for April 2007. The launch of this year's spectacular St Mary's Carnival got off to a dazzling start when four little girls from Eaton Bray and Edlesborough were picked to star in the event. Eight-year-old Melissa Sibley, from Edlesborough, has been chosen as this year's carnival queen. With her leading the carnival parade will be Eaton Bray youngsters Bethan Roberts, eight, as her princess, and Emma Baldwin, nine, and Katie Neal, 10, as attendants. This year's carnival, being held on Edlesborough Green on July 7, has the theme of favourite adverts and will feature some new ideas, including a climbing wall for the more adventurous, and a silent auctions for those looking for a bargain. As usual the day will kick off with a colourful parade through the two villages while the Green will play host to stalls, sideshows, games and arena events. Proceeds from the day will be split between St Mary's Church, the Edlesborough Cemetery Access Project and local groups and organisations. The carnival committee is always looking for volunteers to help make the day run smoothly. If you can offer any help contact chairman, Peter Bennett. Pictured left to right are: Emma, Melissa, Katie and Bethan. For more information, see the Carnival website - www.stmarysvillagecarnival.com. Rodents gnawing at electrical cables are believed to have caused a huge blaze in Eaton Bray that sparked a massive fire service operation. A quarter of the county's firefighting team was called into action to quell the flames at the Honeywick Works in Totternhoe Road. A motorcycle workshop and a cottage were devastated by the inferno, which broke out shortly after 1pm on Thursday. It took 36 firefighters and five officers two-and-a-half hours to get the flames under control, and they had the added headache of removing nine potentially deadly gas cylinders to prevent a huge explosion. No-one was hurt in the incident, but an ambulance was kept on standby as the fire spread through the building. There was no-one in the timberframed building - which contains the motorcycle workshop, a carpenter's workshop and a twostorey cottage - when the fire broke out. Station Commander Mark Barter, of Dunstable Fire Station, said that a call came in at 1.25pm and a fire engine was on the scene within eight minutes. "We didn't bring it under control until 4pm," he said. Mr Barter added that the blaze started between wall cavities and quickly spread. Crews had to act quickly to remove nine acetylene gas cylinders, and an exclusion zone was set up to keep the public clear. The fire chief said: "If we had not removed them it would have been extremely dangerous." Penny O'Grady, manager of neighbouring sign makers Pinstripes, called the fire service after spotting smoke coming from the motorbike workshop. At first she thought it looked fairly minor, but the blaze soon spread. "It went up the walls and into the roof, and it just spread across the roof," she said. "It was really bad. Everyone was frightened it would spread to the other units. It was scary." Pinstripes lost its phone service as a result of the fire, but was able to continue trading the next day. 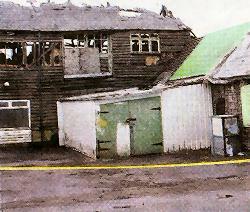 But Penny said that the house and the motorbike workshop had been severely damaged. "There's no roof left, the top floor's all gone," she added. And carpenter Graham Davis, who rents one of the units in the building, said: "The house has got it the worst, you can't live in there now." But he added that the damage to his workshop was minimal. Fire crews managed to salvage a number of custom-made motorbikes and specialist tools, but were forced to withdraw as the fire spread to the first floor of the workshop. The blaze also hit the cottage, where firefighters using breathing equipment were able to save some of the owner's belongings. Mr Barter said: "The crews did spend a brief amount of time getting the valuables out. "We couldn't save everything but we did manage to save some paperwork and some items of personal effects before it was too unsafe." Crews from Dunstable, Luton, Toddington, Kempston and Leighton Buzzard tackled the blaze from outside, using an aerial platform. Mr Barter said: "The house was severely damaged, the whole of the motorcycle workshop was severely damaged and the roof has collapsed." He said that a preliminary investigation indicated that rats and mice were to blame. "It's not uncommon, particularly in older buildings out in the villages," he added. The fire chief said that regular electrical inspections are a key safeguard, and if anyone becomes aware of rats or mice they should call in pest control to prevent fires like this breaking out. Dunstable Amateur Operatic Society is promising three exciting evening of entertainment in Eaton Bray this week. Tomorrow, Friday and Saturday, members will be staging an Olde Tyme Music Hall, where there will be a mixture of musical numbers, melodrama, comedy sketches and colourful dance. The shows start at 7.30pm at Eaton Bray Village Hall. Tickets cost £7.50 and include supper. To book a seat contact the society's box office on 0845 8386742. And 2007 is shaping up to be a good year for the group, as a slot at Dunstable's new Grove Theatre, which was unveiled to the public at the weekend, is in the pipeline. Rehearsals will start soon for 42nd Street, but publicity officer Manda Isiekwe said: "We can only perform at the theatre if we have the cast and most importantly the audience to keep us there, so please continue to support us." Initially the teams looked evenly matched, both forcing corners from good attacking play. It was fifteen minutes before Watling penetrated Lions' defence to score. Watling's goalie blocked a shot by Morgan O'Connell and Lions failed to score from another three opportunities. Meanwhile, good tackling by Lee Cavendish and James Thiel and great work by goalie, Charlie Oliver, kept Watling at bay. Just before half-time a Watling striker found himself with plenty of time to pick his spot for their second goal. Frequent substitutions allowed both sides to keep the pace up in the warm conditions, and Watling made an impressive attack up the right wing to score their third. Watling's number 16 secured his hat-trick with a superb shot shortly afterwards. Lions piled on the pressure up to the whistle, but they allowed Watling too much space midfield and couldn't match their opponents finishing skills. Lee Cavendish was Lion's MoM. Lions faced a top team without two regular players, but never gave up. Westoning attacked straight from the start and it was only down to excellent defending by James Thiel and Andy Broughton that the half time score was only 0-2. Sam Marshall and Matt Audouard had good chances but the ball evaded the net every time. Westoning tactics were to pass the ball only about 15 yards at a time from end to end, basically keep possession and get it to a forward for the final shot. Or, on one lucky occasion, try a shot from the touch line and catch the keeper out. The second half was lively as well. Lions prevented the score from getting really high by applying pressure and not letting Westoning totally dominate. Numerous substitutions by Lions kept them refreshed, but more tackling in midfield would have allowed Lions to go forward again. Jack Coates was Lions' MoM. 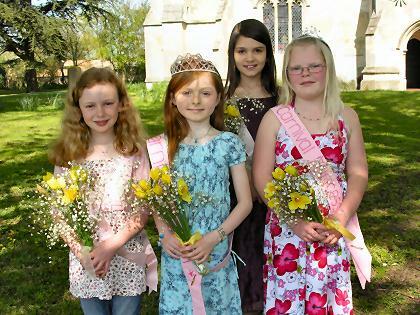 The Carnival Queen, Princess and Attendants for the 2007 St Mary's Village Carnival were chosen this morning in Eaton Bray Village Hall. Pictures will soon be available on the St Mary's Village Carnival website. The Carnival itself will take place on 7 July 2007. If you are able to offer your help, please get in contact with the Carnival Committee. Update (19-Apr): Pictures are now available. Police may be promising to come down hard on nuisance motorcyclists in the area. But their response to them so far has been dubbed "absolutely farcical". Last week it was announced that bikers who break the law could face having their bikes crushed. But now a police spokesman has admitted that responding to calls about two-wheeled troublemakers quickly isn't always the top priority. An angry Eaton Bray householder has said that her efforts to get the police on the case have so far been in vain. Marion Heyland of Manton Road rang police last Monday because of the problems bikers were causing. But she claimed that she didn't receive a response until several hours later, by which time the youngsters had moved on of their own accord. "I'm concerned about the lack of response with the police," she said. "It's absolutely farcical." A belated thank you to everybody who collected Tesco Sport for Schools & Clubs vouchers for us at the end of 2006. As a result we have been able to obtain some very useful training equipment for the teams. We are also expecting to be able to use our new storage facility very soon, which has been partially funded by the AVDC Sports Grant team. Thank you to Edlesborough School for kindly allowing us to site the facility at the school. If you would like to check up on the progress of the various teams in the club, please access our website at www.eblions.co.uk. Match reports for some of the teams also appear in the Leighton Buzzard Observer. Looking to the future, a new U7 boys' team and an U10 girls' team will be formed for next season. Also, the club is still interested in finding a permanent site where we could have room for a pavilion, about three junior pitches and a senior pitch. If anybody knows of a suitable site please contact the club chairman, Andrew Lancefield. Thank you to those who sent in responses to our survey earlier in the year. You told us quite clearly that you love our carnival just as it is. There were some suggestions for things we already do... so make sure when you come to the carnival that you don't miss a thing, whether it's the cake stall, BBQ or the entertainment in the arena. Your carnival programme will give you full details. The carnival format will stay the same but we do like to introduce some new things to entertain you all. To book a pitch for your group or organisation, contact Chris Banks and you could be raking in the profits. And remember to give your stall the edge by dressing up for our theme... Favourite Adverts. The carnival programme is widely distributed and read by several thousand households and many local businesses advertise regularly in this publication. You can book adverts at a competitive price to reach your customers. Contact our website or chairman Peter Bennett for details. Wanted...Helpers and... a 20 foot shipping container! We would love to hear from people who would like to help with the carnival. The great community spirit of our villagers is the reason we have such a wonderful event each summer. If you've never experienced it, come and get involved, because that way you'll get even more out of it. Especially for those who like a little adventure. Scaling Mount Everest it's not, but we expect this one to be a big hit. Can you make it to the top? Shhhh... It's a great way to choose the price you want to pay for that special item,...but prepare for some fierce competition. We are expecting some very interesting lots for bidding, but you'll need to keep an eye on your favourites. All proceeds will be split equally between Eaton Bray Tennis Club and Eaton Bray Village Hall refurbishment. Prize for winners; Raffle; Teams of up to 8 people. Contact Ross or Katrina for tickets. Though we moved out of Eaton Bray in the summer, we hope it's a case of gone but not forgotten. Shaun is cycling around Ireland, give or take a peninsula or two, at a distance of about 1300 miles, starting on 24th March. So, by the time you read this, he ought to be about halfway round and heading down the west coast. Whilst he may be enjoying one of his favourite parts of the world, and possibly the odd drop of Guinness to fortify him, such a distance is no mean feat for a man approaching forty, so he is raising money in aid of cancer-related charities as he goes. Your generous contribution would be most appreciated. Some of you may remember his articles in Focus in 1995 describing his ride from John O'Groats to Land's End, from which over £3000 was raised, so that sounds like a good target to try and beat this time. All those years ago, the internet was just a glint in somebody's eye but, in 2007, if you have access to it, sponsorship is easy. Go to the website www.drude.co.uk you can read more about this venture and it will also direct you to an official charity giving site. For those of you who prefer more traditional methods, you can mark your pledge and leave your cash (or cheque) at Eaton Bray Lower School, who have kindly agreed to help out - if any queries on that, Liz Warby would be happy to hear from you, or speak to Liz Constable in the school office on 220468 (days). The Local Pension Service have officers who visit pensioners in their own homes, in this area and want to make sure you are not missing out on money from the Government - money that is rightfully yours. A full benefit entitlement check is provided, as well as help to complete any application forms. This includes checking your eligibility to various entitlements such as Attendance Allowance, Council Tax Benefit, Housing Benefit and Pension Credit. We can also help you to access services provided by other organisations who may be of use to you, for example, help with home adaptations/security or information on social activities in your area. If you would like to take advantage of this service please call the Local Pension Service on Bedford (01234) 361710, to arrange a convenient visit in your own home. The Annual Parish meeting is to be held at the Coffee Tavern on Tuesday 8th May 2007 at 7.30pm. The next Parish Council meeting to be held at the Coffee Tavern on Wednesday 9th May 2007 at 7.30pm. Why following Him should be banned; I was just a young impressionable youth. I was still searching for the truth. Céasar was our living God; but we had many another. I had come here to visit, the Tribune, my brother. A bringer of 'Good News', A deliverer, a shepherd for His sheep. This place is so boring - I'm almost asleep!. I came because a crucifixion meant at last some small measure of excitement. He this farce will oversee". "Kill Him", we cried, "Let Him be crucified". Lightning, wind, rain, the people took fright. The Temple curtain rent in two. Himself, 'The Son of the Lord'. But I was His MOTHER:...Oh,don't you see, why didn't He say a last word to me?. And mixed with the mud... The heavens were dark, storm filled the air. Where were His friends? Did they not care? He was my firstborn, my eldest son. And gave Him vinegar, when He asked for water to sip. They put on His head a crown of thorn, was this really why He was born? I was there at the foot of the cross; for it's with my mind that I can see. I know when He died it was for me. That far away day yet very near. or fall. His presence is always at my side, and it's in His love, that I abide. For I know that He will come again,and when He does there will be no pain. Wherever we meet; the foot of the cross, the mercy seat. The thought of love, its undying ember, I can't forget............ DO YOU REMEMBER...? BOOK SALE and PLOUGHMANS LUNCHES on Saturday April 14th. Sale from 11.00am and Lunches served from 12.00 noon until 2.00pm. Anyone with books to donate please contact Sandra or Alannah and they will arrange to collect them from you. THE TIGERS CLUB in Uganda which enables street children to realize their potential and discover their worth. This charity is now extending its work into Ethiopia and Kenya, helping their street children too. SMILE INTERNATIONAL which is a charity helping to relieve suffering and poverty in over 20 countries throughout the world,by providing humanitarian aid and long term development projects. The charity is perhaps best known for the "Shoe Box Appeal" which we take part in every year. Please help us make this (what is for us a new venture) a successful event by donating books and coming along on the day for the Book Sale and Lunches. April 6th Good Friday United Service @ 10.30 am. April 8th Easter Day Family Communion Service @ 10.30am. May 4th Organ Encore with Len Rawle. Admission by programme only at £5.00 available from Helen. June 9th Garden Fete and Lunches from 12noon at the home of Jane and James McFarland. Please see Open Gardens 2007 for full details. Admission by programme only. These souvenir Programmes must be purchased in advance £5 each from Helen. Profits from this evening's entertainment will be shared equally between Northall and District Age Concern and Eaton Bray Methodist Church. Countless married couples will agree with visitors who say how lucky we are to have such an attractive Church in Our Village. Strange isn't it that we only wonder how such a building has survived for 800 years when we visit it for special occasions like christenings and weddings or at Christmas? Sometimes we try to forget that our forebears have left with us the responsibility of preserving the building for future generations. This is what belonging to The Friends is all about. They will be a group of local people, old friends and others who want to be involved and whose sole aim will be to ensure that the Church building is passed on to the next generation in as good a state of repair as it is now. Achieving this goal will require the funding of a planned maintenance programme, for like any old building there is always something that needs doing to keep out the weather or to keep it safe. Over £200,000 has been spent in the last few years on the stonework and roof and more work is needed to finish off the roof project and to make the floor safe. So this is an invitation to everyone to come along on the 24th to hear talks about the Church building, together with entertainments on the Bells and by the Organ & Choir. Meet The Edlesbray Players and talk about the 2008 Panto, discuss the 2007 Carnival with its organisers, meet staff from the Chiltern MS therapy Centre and talk to representatives from Fairtrade. If you are not free on the 24th and would like to talk about being associated with The Friends then do contact me. You are viewing the April 2007 archive.